In 1952, the state directed that all church records prior to civil registration (1895) be transferred to the Slovak Republic State Archives. Researchers must be aware that the 1895 cutoff was not always followed. In some cases, the cutoff date was earlier and in other cases, records as late as 1940 can be found in the archives. Thanks to the Mormon church, all of the archived church records within the boundaries of present-day Slovakia are in the process of being microfilmed. The records are being made publicly available from Slovakia east to west through their Family History Centers. While the movement of all pre-1895 records to archives may be rule, there appear to be an exceeding number of exceptions to the rule. Jim Nickel points out that some records are often still found in the Satoraljaujhely (Hungary) archives, and others still remain at the local church. Very little information on specific village churches can be found online. Many books have been published in the region, but few have been translated to English. As my work progresses through my lifetime, I will bring to attention publications which are useful to the researcher. For the time being, the texts translated will be specific to my areas of research. One directory of interest is the Dvorzsák Gazetteer. This is a town-by-town count of the numbers of religious congregants, organized by faith and summarized by district and county. An indication of the location of the primary parish. Beginning in about the 1500's, Catholic churches began to record Baptisms, Marriages and Deaths under a government mandate. Small villages only began record keeping in the late 1600's to early 1700's. Of course, many of these villages were only formally established with churches in the 1700's. Larger towns and cities have records from the earliest periods. (Note: Unless you were of nobility, i.e., peasant, your familial records will probably go back no further.) The government recognized the usefulness of such records, especially for military conscription, and declared that these were also civil records and the priest effectively became the "town clerk" for the village. Irregularities are often found in these records. Sometimes the death or birth of an individual outside of the church's faith was recorded. An individual's event might be recorded in a neighboring "affiliated" parish books. 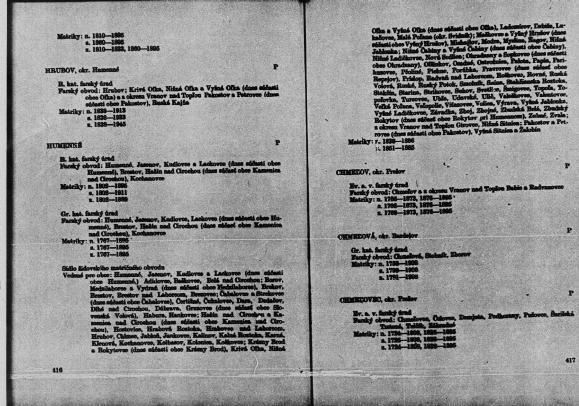 In still others cases where the individual was a religious minority (especially in the case of Jews or Protestants in a predominantly Catholic region), the records might be kept in a more distant large town or city which had regional authority. These events highlight the dichotomy of allowing civil and religious records to become mixed. This mandate continued to be important to the state until the time of civil registration (1895) when the government took it upon themselves to record such information. [Law Nr. XXXIII 1894] Of course, even after that time the church continued recordkeeping for its own purposes, which then became limited to sacramental events, per-se. Format: Before the 1800's most records were written free-hand, as a letter would be. These can be very difficult to scan as the data moves around across each line. It is quite a struggle to search for a surname with this format, though not impossible. In the 1800's (actual date varies by parish), the Hungarian rulers attempted to put some discipline into the record keeping by instituting a tabular recording method. I have included sample pages of Greek Catholic church ledgers. Language and Terminology: Most of these records are written in either Magyar (Hungarian), Ukrainian, Latin or Slovak. One should not be intimidated by the language, especially with regard to tabular records. Once one identifies the column headings, the data contained therein is either dates, given names, surnames or place names, which require no translation. "Church Record Translations" is a useful reference of common Magyar, Hungarian, Latin and Slovak terminology. Some of these words are not in present-day use, thus they may not be found in modern-day dictionaries. Understanding events and their dates goes a long way towards understanding the where, when and why of vital record keeping in present-day Slovakia. On April 28, 1950, the communist government of Czechoslovakia instituted the "Sobor of Presov", which shuttered the Greek Catholic Church. It transferred their parishes to the Russian Orthodox church. Most of the priests, seminarians, nuns and monks who would not embrace Orthodoxy, or were considered conspiratorial were quickly jailed on unsubstantiated charges of treason against the state. The Pope was declared an enemy of the state. Certain other clergy were murdered if they resisted. Church records ostensibly were transferred to the local village offices. The same treatment applied to the Roman Catholic church. Not all Greek Catholic records from 1895 to 1950 were preserved. Some were transferred to the state archive, some kept by the Orthodox church and still others were lost or destroyed. Needless to say, no "official" church records for the period 1950 to 1990 exist, though we do know that various "underground" churches operated. [For 1895 forward, Civil birth/marriage/death records are kept by the village or regional government office.] In 1968, Slovak Ministry of Culture allowed restoration of the Greek Catholic Church. While some buildings were returned, it was only in 1990 when the church regained its strength and freely operate that record keeping resumed. Whether pre-1990 records exist in the village church depends on the individual circumstances of the village church. An example is the records of Velike Lucky which were reported destroyed by Soviet secret police. In the year 1952, the Czechoslovak government removed all church records from 1895 and earlier to the regional state archives. 1895 was the year when the Hungarian government began "civil" registration of birth, marriage and death records. Consequentially, reliable b/m/d records after 1895 are usually found in each respective village "registry" office. For Eastern Slovakia, state records are kept in the Presov, Levoca and other branches. They were subsequently microfilmed by the LDS Family History Center in the early 1990's (the LDS is slowly publishing the films beginning from East Slovakia and moving West.) It has been reported by various researchers that some church records in the archives go no further forward than the 1880's while other records in the archive are as late as 1940. In general, Slovakia has a privacy rule, which restricts the release of documents less than 100 years old to verified family or official government use. In the case of records less than 100 years old, civil registrations are presently maintained locally, usually in the village Registrar office. In remote areas several villages may be served by one office. In many cases, a second copy of the church registers was made. It was often called a "Druhopisy" in ecclesiastical terminology. This second copy was mandated by the government (see Short Comment below.) The second copy was originally intended to be kept by the government. These copies are today sometimes found in a regional church administrative office or found their way into the Slovakia State Archives. This copy is not always to be found. In some cases, Certain "Bishops Copies" have been found at the National Archives of Hungary in Satoraljaujhely, Hungary. Satoraljaujhely was the administrative capital of the old (pre-1918) Hungarian county of Zemplin which extended north into today's Slovakia. [Zemplin County was somewhat unique in that it was one of the only counties divided between Hungary and Slovakia as part of the 1918 Paris Peace Treaty.] Technically, all documents related to Slovakia territories belong to Slovakia. As the country was restructured (post WWI, post-1991) these records were "supposed" to be transferred. Obviously this didn't happen. Mick Sura and Jim Nickel have visited this archive and viewed church records from Ruska Bystra, Snina, Stakcin and Zboj. There are also many census records. It appears that hiring a researcher to extract these records from the Hungary archives is a more effective mechanism than writing to the Hungary Archives. If you are aware of any other Slovakia records which may have remained in the Hungary Archives, please drop me a note. Jim Nickel points out that not all records that are "supposed to be" in the archives are, in fact, at the archives. Jim's cousins have been successful in contacting the present-day parish and inquiring about records which may be found there. It may include both 19th, 20th century records. While writing to the church directly may be an option, your likelihood of success is much greater by a personal visit. A local researcher would be an excellent choice for this type of research. 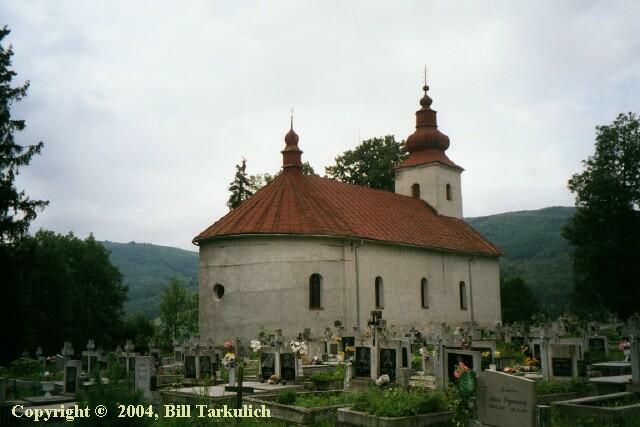 Present-day Slovakia Parish Directories on the web are listed below. They are indeed incomplete, a work in progress. Look under "Slovenske cirekvne provincie" - Slovakia Church locations - There are six dioceses - Bratislava-Trnava, Nitra, Banko Bystricia, Roznaksvaka, Spisska and Košice. Be careful not to assume that the present-day parish organization is as it was 100 years prior. Although the Greek Catholics have taken back many of their church buildings from the Orthodox, some have not and received restitution. For those desiring a more complete understanding of the Greek Catholic Church, Andrew J. Shipman wrote an excellent introductory treatise "Greek Catholics in America" in the year 1909 for The Catholic Encyclopedia, Volume VI. It gives a 1909 perspective on the immigration of Rusyns to America (including their origins), a description of exactly what the Greek Catholic Church ascribes to, how it relates to the other rites of the church, immigration statistics, establishment of parishes in America and their leaders. It provides secondary coverage of Rumanian, Syrian and Italian Greek Catholics. I find this article to be particularly insightful as it wrote about our immigrant ancestors in the present tense, with fresh information. It gives the modern-day reader a perspective into day-to-day life and thinking of the times. It is a refreshing change from the broad-brush theological discussion of the Greek Catholic Church I have found elsewhere. It is generally a fair assumption that those of Rusyn (Ruthenian) ethnicity are Greek Catholic and vica-versa. Of course exceptions exists, so seek corroborating evidence. In 1950, the Czechoslovak State instituted laws which turned over Greek Catholic Property to the Russian Orthodox church. In 1968, during the "Prague Spring", the Greek Catholic church was legalized and some of the church buildings returned. The remainder of the church property did not return to the Greek Catholic church until 1993. In some cases, congregants chose to remain Orthodox, the Greek Catholic church was compensated otherwise. The Greek Catholic church was singled out by the Marxist ideologues as a Rome conspiricy to undermine the Russian Orthodox. This attitude was held since the Union of Brest and Uzghorod in the 1500s. While other faiths were constrained and directly controlled under Communism, they continued to operate. Only the Greek Catholic Church was singled out for liquidation. "The Night of the Barbarians" Memoirs of the Communist Persecution of the Slovak Cardinal Jan Chryzostom Cardinal Korec, S. J. Forward by John Paul II, 2002, Bolchazy-Carducci Publishers, Inc. In the majority of small, rural villages, one priest/minister typically ministered to multiple villages. A church would be constructed in each village. This collection of churches is known as a "parish." The priest/minister would have his home/parsonage located in one of these villages, simply known as the "main church" and travel to conduct services at each "affiliated church". Each affiliated church would have its own cemetery, own church building. Marriages, Weddings and Burials were conducted in their respective village church. This arrangement of one priest/minister for multiple villages continues to present times. In cases when the village was too small, the faithful would walk to the nearest church. A village with more than roughly 300 congregants would have a church built in their town. Very large churches often do not have affiliated parishes. Due to the minority Jewish population of Slovakia, the majority of records are found in the larger cities. 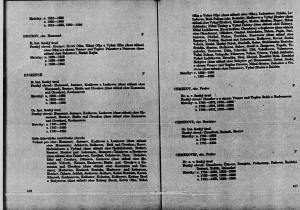 I have indexed Family History Library Catalog of Temple records sourced from the Slovakia State Archives. The foremost online resource for Jewish Genealogy is JewishGen. Do not neglect the Hungarian sections. Much info from these areas is contained therein. As the history of the region is intertwined with that of Ukraine and Poland, we need to recognize that certain bordering records, records of immigrants may be found in those places. Ukraine Church records in Ukraine are principally stored either in the State Archives or in the regional church archives. They are not available from the Mormons. Poland Many of the church records from the Lemko-inhabited southeastern Poland villages were either destroyed or are missing. This is thanks in large part to Operation Vistula which destroyed over two hundred villages and deported their people in 1947. The operation was part of the government's strategy to rid the region of of the UPA Ukrainian Partisans who remained in the region after the conclusion of World War II. Some records have been located in state archives and in certain church archives. For Poland churches unaffected by Operation Vistula, church records are extant, but are only found in the church itself. Sadly, reports have surfaced that these ledgers have become in some cases the victims of vandals - overt removal of pages for souvenirs so it is surmised. Wooden Churches - No discussion of churches would be complete without a short introduction about their magnificent cierkev, wooden churches. Helv Conf. - Helvetica Confession. Also known as "Anabaptists" - Spinoff from Lutheran church. Originating in Switzerland and Germany, migrated to Slovak-majority Moravia in the mid-1500s. Aug. Conf - Augsburg Confession - Lutheran Church. Austro-Hungary Buffet, Course 1 Introduction to History/Geography - Heritagequest Magazine, October 2003 - Contains nice interrelationship map of parliamentary organization of Austria and Hungary. How Far to Church in the Austrian Empire? - (from the history of Albrechtsdorf, Czech Republic), Thanks to Felix Game for the link. Note 1: Credit to Peter Nagy for clarifications to the state record policy. Credit to John Adam for proofreading corrections to the "Prehlad."